I am on my second reading of YTC PAT and in the last couple of days read, again, about Increased/Decreased projection being an indicator of potential trend strength/weakness. 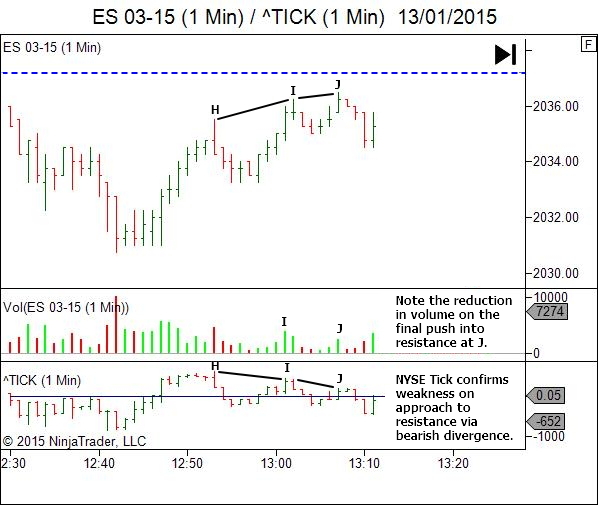 As I was trading ES today, I saw an example of Decreased Projection on the one minute chart. I made a perfect entry based on a textbook example from 11:44 CST to 12:10 CST, with entry short at 2035.50 at 12:10 CST. You will see that the trade went for 34 points maximum favorable excursion with only one tick of heat after entry (maximum adverse excursion). Let's start by examining the market's S/R structure. The chart below is a 30 minute chart at the time of trade entry, so that we can see where the current day fits within the structure provided by recent sessions. Resistance levels are marked above price in red. Support is marked below in green. The current day opened at A before rallying to break higher resistance at B. This break failed and price then fell, breaking the Low of Day at point C before setting up a retest at D. This is our trade location. Structurally, it's a beautiful place to seek a trade. 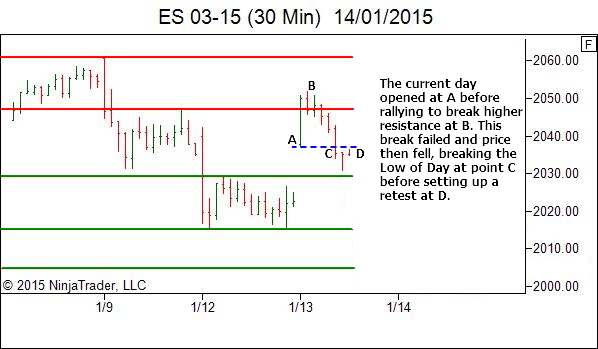 The Low of Day provides support, which once broken becomes new resistance. Let's zoom in a little to a 5 minute chart just to get a slightly different perspective. 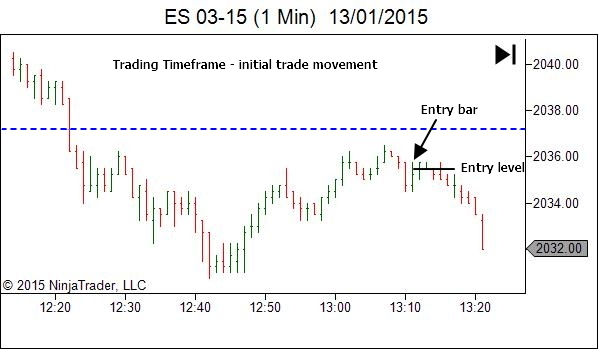 All right… now for the 1-minute trading-timeframe chart so that we can conduct some analysis leading up to the trade. 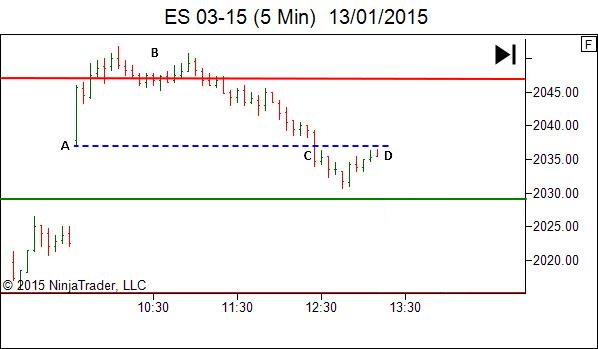 Price broke the Low of Day at point E and continued lower with a downtrend for a further 20 minutes. The downtrend was broken technically at F, although the rejection at H would lead me to keep the downtrend intact until further acceptance above the trend-change point at G.
With an uptrend now in place, we'd be watching to see how price interacts with prior Low of Day support, now turned resistance (the blue dashed line). If you recall the original email, the trader who made this entry observed weakening strength on successive pushes into resistance. For those who have the YTC Price Action Trader, you'll want to review Volume 2, Chapter 3, pages 137-142. Note the weakness becoming evident from swing highs H to I and then to J. Bar K offered some new strength in the bearish direction. 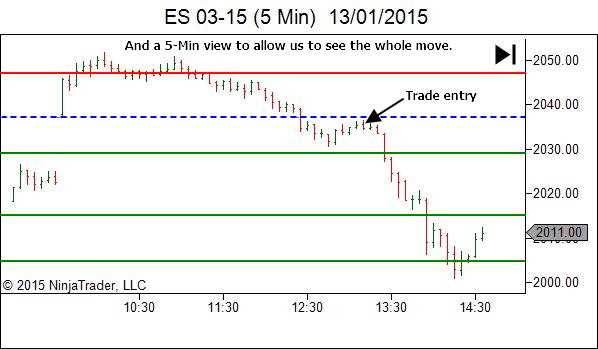 A trade entry was obtained at 2035.50, as shown on the above chart. For those who also like additional non-price analysis to confirm what price is showing, the following chart also displays both volume and the NYSE Tick. 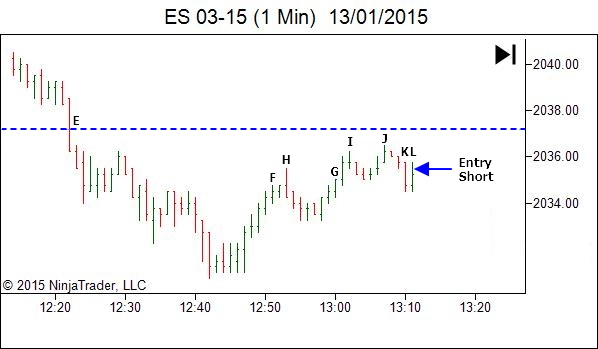 Both confirm the weakness in the market as price approached resistance. And finally, let's check the extent of the move that follows. The key lesson in this article is the location of the trade, retesting the prior Low of Day after having broken below this level. This is one structurally significant level that you ALWAYS want to be watching for trade opportunity. The extent of the move is just beautiful. Unfortunately they won't always work out so well. But you can't catch them if you're not in them. Enter… and manage whatever the market provides you. The original email continued with a little discussion about the exit, which I won't share, suffice to say that the trader was unable to capture a significant portion of the move due to his stop being held too tight. The promising thing is the ending of the email, where our trader recognizes that learning to trade is a process of growth and development. I will get better with trade management. With time I will learn to recognize "A" grade setups like this one that should be managed a little less aggressively and the payoff will be huge. Your PAT is making a difference for me and I really appreciate the material and your regular lessons on twitter! Don't be too concerned about the missed opportunity. Although trade management is something that can never be completely mastered, our skill in making good risk decisions does improve with experience. As you said, with time you will learn to recognize "A" grade setups. This is one of them. If it helps you feel better… I almost always MASSIVELY UNDERPERFORM when offered a move like this one. Becoming a trader is a process of skill development. Learning to trade in the right places comes first. Management of the trades will develop later. Trade – Record – Review – Improve! I understood why downtrend was broken at F as F broke the swing high that gave the lowest low. Then since there was rejection at H, you assumed the downtrend is intact. But why do you call g as trend change point? Is it because thats equal to F, the previous trend-change point? Yes, that’s essentially right. What I’m looking for to confirm a change of trend is price acceptance beyond the trend change point. The rejection at H was not price acceptance. But when H failed to follow through with any significant movement lower, and instead made a higher low, I then called a “confirmed” change of trend on the second push back above the trend change point. Although really the bar after G is the one that makes it more obvious. Perhaps I should have labelled G one bar later? Either way, this is kind of what I’m looking for. Ideally the first break of a trend change point will hold and continue further. If not, look for subsequent breaks to hold before accepting the change. Given the significance of the level which was broken earlier, you could be well within your rights to suggest that a downtrend remains intact while price does not break back above that level. This is a much simpler way to view the structure. 2) Take counter trend trade only at the structural S/R. Apart from this, is there any other place where you use the definition of trend? I’m not really sure how to answer this. I am aware of, and use, the trend structure at ALL times throughout the whole trading session. It’s not just something for specific times and places. How I use it is outlined in volumes 2 and 3 of the YTC Price Action Trader.